When booking my hotel room for Denmark with expedia I received this Travel Sim Card free of charge. If you are a frequent traveler and live in the UK then this is something worth investing in. You can receive calls free of charge in most Countries of the world. 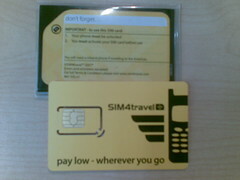 The added bonus is that unlike most other travel Sim card you have a regular UK phone number. So this means you can redirect your normal phone to this UK phone number and will not have to pay (if you have enough inclusive minutes). There was the day I started calling my friends FOR FREE Cross Continent Mobile to Mobile. How did this happen? Well it happened by accident. I called a friend. She lost connection (or hung up on me) and then the computer voice said: If you have asked your friend to call you back stay on the line while your friend calls you back and we connect you. Then another friend was totally excited (I called to the States) Hey are you in New York? You are in New York 🙂 You did visit me at last. I asked *HU* ? Your number you are calling me from is a New York number. Then I got it. Next call to my parents. Me: “Hey what number do you see on your display?” My parents: “Funny you ask, one from Vienna”. Me: “O.k. hang up – call this number – It will be me on my mobile.” I did not tell my parents that I will be waiting on the line (would have caused confusion) Viola – Rebtel connected us and the call was FREE 🙂 Yippee – This was back in May or so – since I call my parents, my friends, my ex girlfriends and the girls I adore on a regular basis whenever I think of them totally free of charge. Does anyone have any idea how to uninstall? Reason? well it is a suspect of crashing my Nokia E65 in any possible situation. I know it is beta software so this is o.k. but I want to uninstall it and am not happy of not finding any info. UPDATE – Their support team is very reactive and fast. This is very seldom in this industry. Thanks Truephone team!! I found out about a company called Rebtel about a month ago and have been using them since. I can make international calls from my mobile almost free. On their website it all looks complicated but it is not. You sign up for the service on their website. Then you enter the numbers you want to call. For each international number you enter you receive a local number from Rebtel. 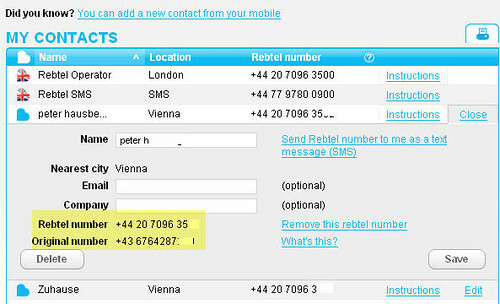 For instance I put Peter in my Rebtel phone book with his Austrian number 0043 6764287xx and received a London number from Rebtel for example 0044 20 709635xx to enter in to my normal mobile phone address book. You will need to buy credit but you can do this from as little as GBP 2,50 or USD 5,00 so nothing dramatic. I can then call the local number (the number given from Rebtel) and can speak to Peter for 1 pence per minute – from UK to Austria 🙂 using my mobile phone. Rebtel gives you the option to make free calls if your friend calls you back in a certain time but I would forget this since 1 pence is virtually free anyway….